This is another approach to drawing people. 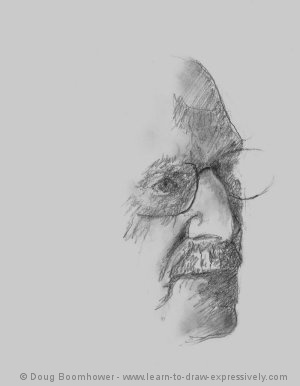 Drawing pencil sketches is the most immediate way to get in touch with the subjects you have chosen to draw. Since all you use is a drawing pencil, a piece of paper, and an eraser, you are free to concentrate solely on the drawing. You don't have to be concerned with using your materials correctly, (for example oil paints, paint thinners, brushes, color mixing, palettes, canvases, and so on). All you have to think about is simply getting the pencil lines down on the paper ... you're going straight to the "matter of drawing". The term “sketch” can often be misunderstood. A sketch is often thought to be quickly done, unfinished, and possess an "amateur" quality. I do agree that sketches are done quickly, however, they can create beautiful pieces of art. Drawing Pencil Sketches - How Long Do They Take? I prefer to think of a sketch as a quickly done "drawing". And of course, how quickly that drawing is done can vary a great deal. Sketches can be done with a few lines , in just a couple of minutes ... and they can produce wonderful results. Other "sketches" can take a couple of hours ... and they, too, can produce wonderful results. The above, is an example of a pencil sketch I did of a friend who sat for me. Despite its simplicity, it captures the likeness and the essential character of my friend, Sandra. It shows what can be done with just a few lines ... but those few lines, are the correct lines. Remember a "sketch" is just another name for a quickly done drawing. Quick drawings have to be accurate, but in order to put lines down accurately on paper, you have to practice. 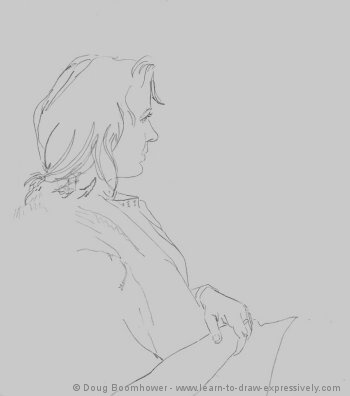 If you look at the contour drawings and gesture drawings you'll understand the importance of capturing your pencil lines quickly. I spent a day at a Senior Citizens' high-rise in my search for subjects to draw. I found a couple of enthusiastic volunteers. 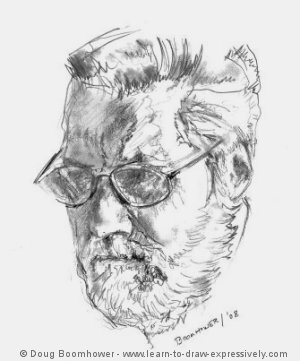 This is a drawing of Mr. David Parsons. He was an intelligent man with a fascinating history. Mr. Parsons was pleased with his drawing, since it captured him so accurately. One of the benefits of drawing people from life is that you get to know some interesting people in a remarkably short period of time. I'm not sure, but this very well might help me subconsciously to capture their character. This drawing took one hour. 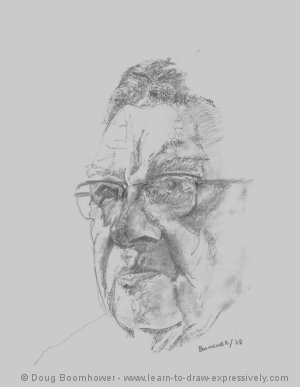 Here is a drawing I did of Harry Smith. Harry was a musical icon in my home town of Saskatoon. At 90 years of age, he still played great piano, and had a wonderful sense of humor. He must have known almost every jazz standard that was ever written. Between the tunes I was honored to hear him play, and the jokes he told me ... I couldn't get him to sit still. Therefore this drawing had to be done in ten minutes. That's the fastest, accurately drawn portrait I've ever done! Acquaintances who have seen the drawing, say it looks just like him. What an entertaining visit with a marvelous man. Drawing pencil sketches from life is always a challenge, but Bill proved to be a surprisingly patient model. As always, I produced a variety of images during a few visits to his home. I chose this one because I thought it captured him the best. Subscribe to my RSS feed ... there's more to come on drawing pencil sketches.